While slipping under the radar of most moviegoers at the time, this romantic comedy's joint British-American production—shot entirely in France—served as an early introduction to American audiences of both Emma Thompson and Hugh Grant. 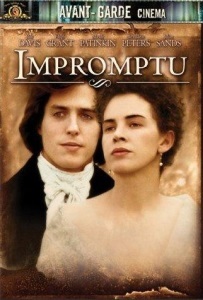 Though only bearing a loose affiliation with genuine historical events, the movie follows novelist George Sand's romantic pursuit of composer Frédéric Chopin among their loose-knit society of writers, artists and composers living in 1830s Paris. After converging on the country estate of the Duke and Duchess d'Antan, George Sand and her friends—poet Alfred de Musset, painter Eugène Delacroix, and composers Franz Liszt and Frédéric Chopin—cope with romantic folly and betrayals, all while trading quotable dialogue that never fails to sparkle. The main cast reads as a veritable who’s who of 1991 talent, including Judy Davis in the main rôle of novelist George Sand, Mandy Patinkin, Bernadette Peters, and Julian Sands. I unreservedly love this amazing movie, and it has served as perhaps my most reliable go-to film when I need to scrounge up a fun suggestion on the fly. I can rely on the fact they’ve never seen it, and no one has ever been anything but delighted by it when they do. Almost unbearably witty, the entire cast shines. How odd! I hadn't thought of this in years but this Sunday brought it up and a dinner and here it is on fanfare. The topic had wandered to artistic French opium smokers or something. I thought I was pulling out an obscure reference but immediately got a "Oh, I loved that movie!" which is of course the correct response. In fact the only person I've ever met who didn't enjoy this was an old piano teacher. As I recall she was convinced Sand killed Chopin young by opening the carriage windows in that last scene. I just introduced my wife to this movie last month, and that was after we'd been on a tear of other Emma Thompson films (Henry V, Much Ado About Nothing, Sense and Sensibility, her small part in An Education) and just realizing how rare it is to see her in a comedy. I hadn't seen the film for decades, and remember renting it back in the day along with Haunted Summer and just having a weekend double-bill of poets and artists hanging out in country houses being witty at each other.